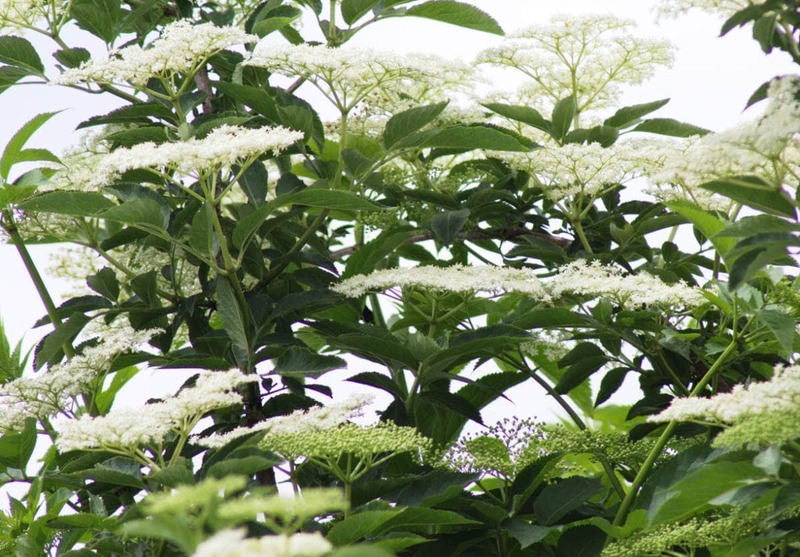 Capture the taste of summer with my Elderflower Liqueur recipe. Freshly picked elderflowers, vodka & lemon work their magic – et voila homemade St Germain! I love elderflowers, their tiny delicate blossoms exuding a sweet intoxicating scent which heralds the beginning of summer. 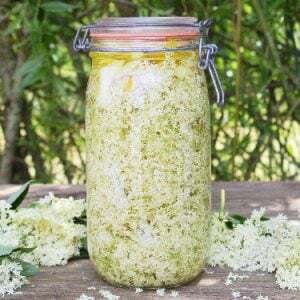 I find myself looking forward to the short flowering season for elderflowers and I really enjoy picking and preserving them to have all year round. Yesterday was glorious, the perfect day for picking the elderflowers I’d been eyeing up for the last couple of weeks. 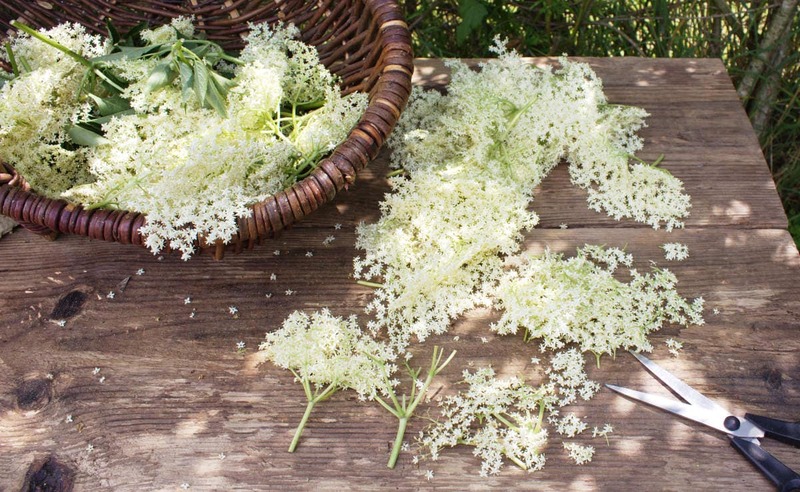 Elderflowers picked, scissors at the ready, a lemon or two, a clean Le Parfait jar and a big bottle of vodka, simples ! I like to make Elderflower Liqueur by adding the sugar in syrup form at the straining stage. You can add the sugar at the initial flower and vodka stage but I find extracting all the flavour from the perfumed elderflowers before adding sugar tends to deliver a purer taste. Also, it’s easier to gauge a sense of the finished product and how sweet you might like it to be if you add sugar to taste after the elderflowers have worked their magic. We love Elderflower Liqueur with sparkling water and a slice of lemon as the perfect summer drink. 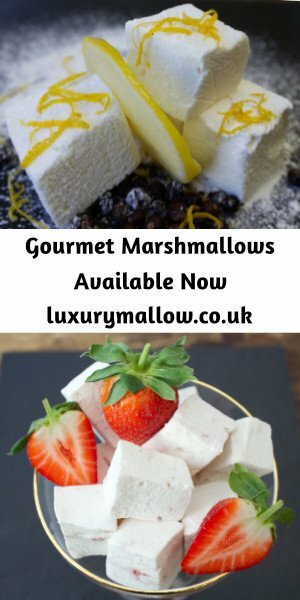 For a special treat, why not try some with champagne – now that really is a treat. Time is of the essence so I’ll stop extolling the virtues of elderflowers and get to the recipe. Here it is in handy printable form. Capture the taste of summer with my Elderflower Liqueur recipe. Freshly picked elderflowers, vodka & lemon work their magic - et voila homemade St Germain! Pick your elderflowers on a sunny day just before noon for the best scent. Discard any with brown flowers. Give each flower head a good shake to get rid of any creepy crawlies, although you will strain them out later. Snip the tiny flower heads off the thick stalks, leaving only the thin stalks attached to the flowers. Place in a cool, dark place for two to four weeks. Make a sugar syrup by gently heating the sugar with the water until the sugar has dissolved. Allow to cool before using. Strain the elderflower, lemon and vodka liquid through a muslin cloth into a bowl. Add half the sugar syrup and taste for sweetness before adding the remaining syrup if required. I use all of the syrup and I find it isn't overly sweet. Keeps for years but I'm sure it won't be on your pantry shelf that long! Best picked and made within two hours. Why not make extra and give a bottle as a gift ? Credit Crunch Munch created by Camilla from Fab Food 4 All & Helen over at Fuss Free Flavours & hosted this month by Lisa over at Lovely Appetite. Simple And In Season hosted by Katie over at Feeding Boys. Hello Hazel, I’m sorry to hear your batch has gone dark. This is usually caused by air so it’s important that the flowers are completely covered by alcohol and your jar doesn’t have much headroom, covering the flowers with the lemon zest usually keeps the flowers steeped in the vodka. Hi, I tried to make this but it doesn’t look good. It has been two weeks since I put the elderflowers, vodka and lemon together, albeit in a 2 l jar as I didn’t have a smaller one. I used the quantities stated in the recipe. All the flowers turned brown in my case and so did the liquid which tastes rather unpleasant. I still went ahead and mixed the filtered liquid with the sugary syrup. It is all bottled up now but I don’t hold much hope for the final result. Hi Julia, I’m sorry to hear your flowers turned brown but I think it may be because you used a 2 litre jar which means there would be a large air gap. It’s also important to make sure the flowers are completely covered by vodka, the lemon zest placed on top helps to keep them covered. Let me know how you get on. Thanks for sharing your recipe. I do want to try it this year. How do you know the optimal time for picking the blossoms? I have to drive a bit to my picking spot, but don’t want to miss the perfect time. 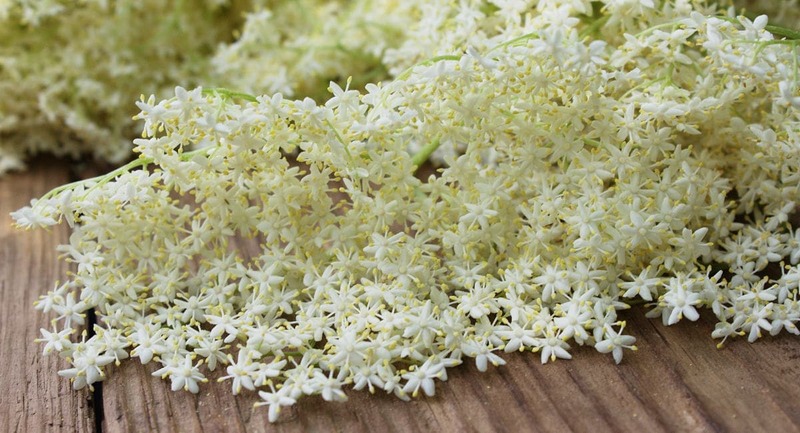 Are you able to use dried elderflowers for elderflower gin/vodka? Hi Joanna, I’ve never tried making Elderflower liqueur with dried flowers but in theory it should work. 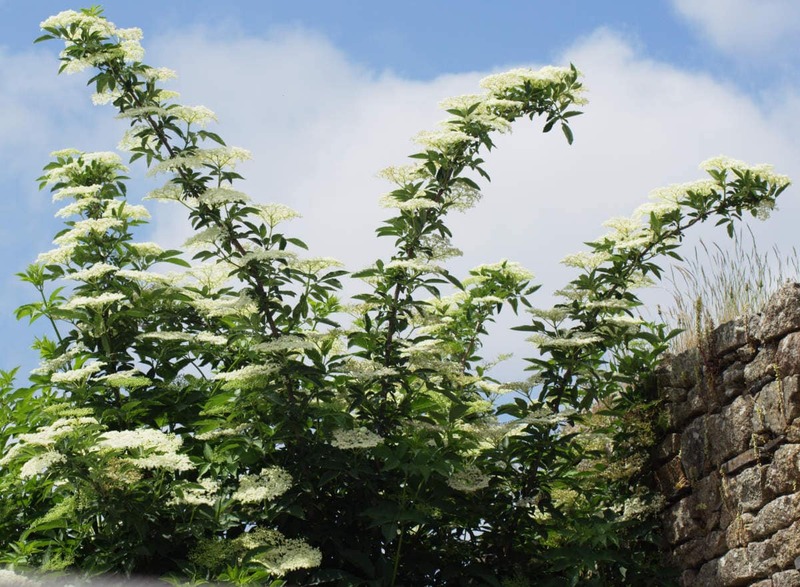 I have seen elderflower cordial recipes using dried elderflowers. 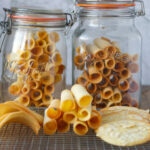 Let me know if you do make some with dried flowers and I can add a note to the recipe. I have an elderflower tree at my holiday cottage in Suffolk but I always manage to miss the flowers and berries. First there are too few and then they are over. Yet another year Im saying next year for the flowers! And the one and only time i got enough berries to make wine. The demijohn was broken. So frustrating. Maybe next year I can make this – I live in hope. How frustrating Jacqui, there’s only one thing for it – you’ll have to stay longer in your holiday cottage to make sure you don’t miss them 🙂 Wishing you luck for next year’s harvest. Wow wow wow I SO need to try this… i’d like to pour it into prosecco… right now!!!! 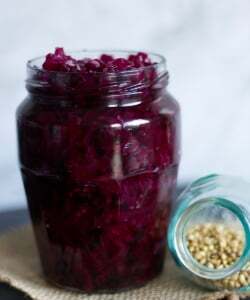 Thanks for sharing it with Simple and in Season – i’m going to make this for sure! 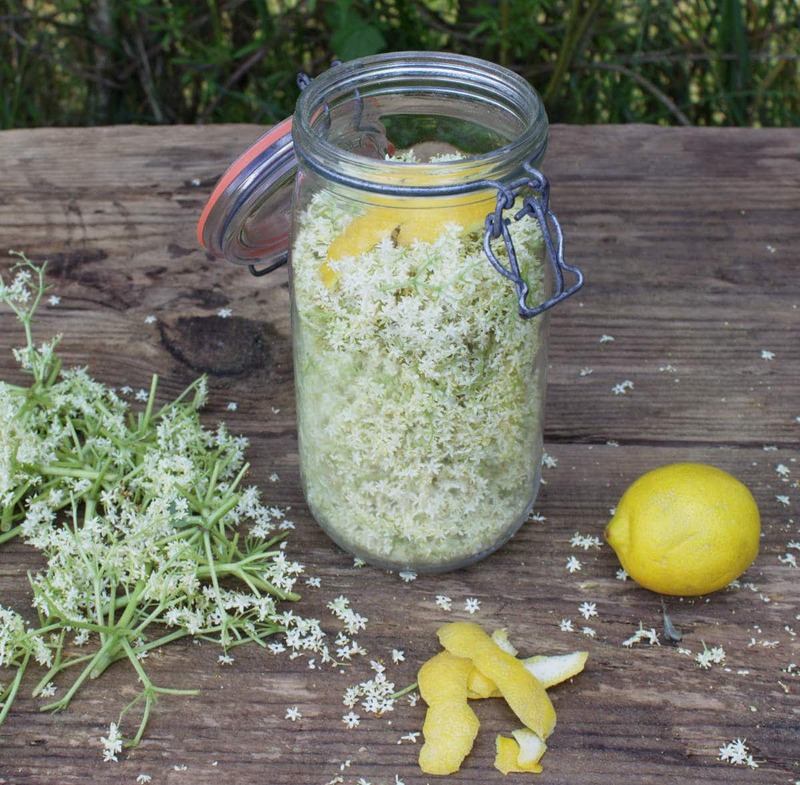 I wish we had access to elderflowers as I know I would like this – elderflower cordial was a favorite when I lived in the UK. I wish I could fine some elderflower over here too! That liquor must have an amazing smell – and taste : ) Thanks a lot for being at FF this week! Ooh what a wonderful tea time treat a glass of this would be. 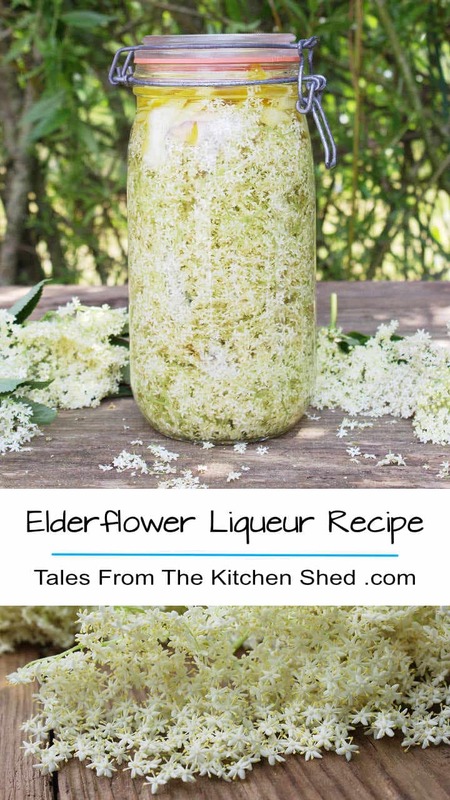 Love the idea of this and with all my homemade liqueur making, I’ve never thought to use elderflowers. Your tip for adding sugar afterwards is an interesting one too and definitely worth trying. What a glorious tree. Thanks Choclette. I suppose it’s my love of St Germain that got me making Elderflower Liqueur, you’ll have to let me know how you find adding the sugar at the end. 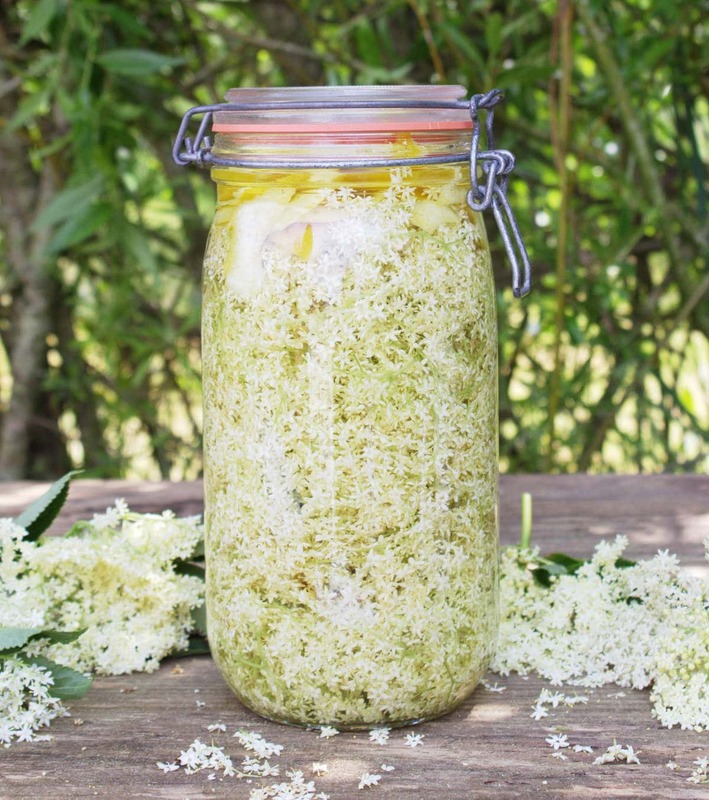 Elderflowers are only just coming into bloom around here – cordial, champagne and now this beautiful liqueur are on my ‘To Do’ list. I love this time of year. Thanks for sharing the recipe. Thanks Felicity, I love this time of year too. A pleasure to share the recipe & let me know how you get on. This sounds absolutely gorgeous – I love the tang of elderflower at this time of year as it’s so refreshing. I’m a gin fiend though so may have to swap out the vodka ? Thanks, I’m sure the botanicals in gin would work really well with he elderflowers, do let me know if you make some Elderflower Gin. I bet that your elderflower liqueur is so fragrant Sarah. I’m not much of a drinker but I can imagine that it’s lovely with the sparkling wine. Those elderflower blooms are so pretty too, I have to admit that I’ve never really taken the time to look at how delicate each individual flower is. Thanks for stopping by Claire, it’s a pleasure to share the recipe. Oh what a delicious sounding liquer. Not this year, but in the future I would very much like to try this. Great post as always. Sammie X.
I am LOVING the elderflower! What a fab tree to pick from too, look a all those blossoms! My father in Law is picking me up some more this week and I am SO giving this recipe a go! I love a splash of elderflower liqueur in prosecco!